Celtic Dragon Address Plaque - - personalized address sign with Celtic knot border that includes Celtic dragon accents. Wall mount 17.25"W x 9.25"H. Made in USA. According to Celtic lore, dragons are protectors of Earth and all living things. The Celtic knot border symbolizes the interconnection of all things and the continuous cycle of existence. The handmade, premium grade aluminum casting showcases an intricate Irish theme design. Line 1 holds up to 6 characters. Line 2 holds up to 16 characters. Dimensions: 17.25"W x 9.25"H x 0.375". 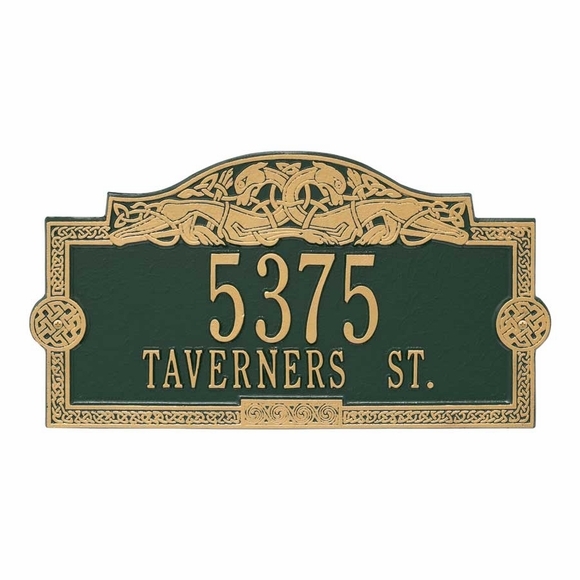 Personalized address sign with Celtic knot border and Celtic dragon accents. Made in USA.